Welcome To Our 2017-2018 Panel Members! From Kristina: As a panelist last year, I was able to expand my knowledge of modern day women’s rights issues and learn a lot more about myself as an emerging woman in business. I enjoyed the behind the scenes planning of events, and appreciated the bond that I was able to make with my fellow panelists. I was able to make so many different connections through the IWL sponsored workshops and conversation projects, and being able to assist in planning them was an added pleasure. I was able to learn about and interact with so many different strong women in business as well as many strong female students who taught me how to become a confident and strong woman in the business world. 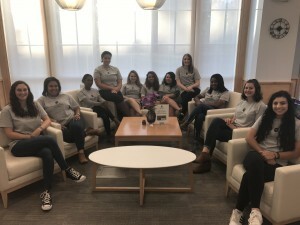 From Isabella: For the past two years, I have been a member of the IWL Student Advisory Panel where I have been able to learn the challenges that women face in the business world, a male-dominated industry when it comes to achieving leadership positions where a wage gap still exists today. At each and every conversation project I have enjoyed meeting various professional women who are in leadership roles that have defied the odds. I have taken away various useful tips and helpful advice that I can share with myself and others along the way throughout my career. From Sammi: As a panelist, I’ve learned a lot and participated in many events to help advocate for women’s equality and equal pay. Not only did this club help educate me on the upsetting facts on the inequality in this country towards women, but it made me want to make a difference by influencing and informing people around me about the unfortunate treatment women receive. From Karen: The experience that the Institute has provided me with has been incredible. We have prepared empowering campus events to raise awareness about women rights and specifically the wage gap. It’s important for women on campus to unite their voices and through events such as the Awareness Week fight for the equality that we as women deserve. It has been important for the institute throughout these years to create an impact on campus and have women join the cause. It is important to me to become part of the Institute for Women’s Leadership each year, because it allows me the ability to voice my opinions and help the other students on the panel to come up with events that will change what people think and lead women to a better future. From Marsha: I would like to be a part of the Institute for Women’s Leadership advisory panel because I am eager for change and want to be a part of a group that’s so much bigger than me. Advocacy is a powerful tool and I want to be a part of a group that advocates for an issue to be paid attention to as that’s often where change starts. If given the opportunity to be a part of this panel I will have access and visibility to women who have ideas of how to go about changing the way women are looked at and treated. When I leave Nichols I can share those experiences and hopefully inspire other women. From Lexxus: I’m looking to improve my leadership skills. I’m hoping to better my chances at surviving the Criminal Justice field and I believe the Institute for Women’s Leadership will do that and so much more for myself and the other females on campus. I would also love to be chosen as a panel member to give me an edge and learn more about myself. 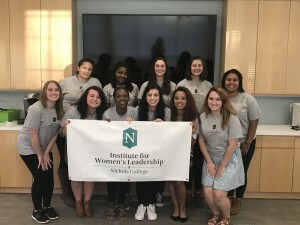 From Kaylin: The Institute for Women’s Leadership would allow me not only to continue to learn more about issues involving women, but would provide me an opportunity to meet with other individuals who would also like to see changes. From Samara: If I am selected to be on the Student Advisory Panel for the Institute for Woman’s Leadership, I will not refrain from expressing ideas I have to encourage women everywhere. From Patricia: I am very enthusiastic and eager about applying to the panel because women’s leadership is something that I will always feel passionate about. Last year the IWL events that I attended were very life changing.T hey brought many well-rounded women into my life who genuinely cared about my education and other facets that could keep me stable after college. From Darianaliz: When thinking about the Institute for Women’s Leadership I think about the endless opportunities that I must not only become a great leader but also to promote awareness to the issues that women are facing. I want to set a standard for not just my little sister to look up to but to do something that can help me to better myself so I can help others do the same. From Megan: I am a big supporter of women’s rights, and am very interested in joining the Student Advisory Panel to encourage the conversation of women’s leadership. From Sophia: I want to be on the panel to help inspire young girls like me to be more confident in themselves and everything that they do, the same way Gina Rodriguez inspired me. I do not just want to say women should be more confident, but I want to inspire them to do so and create great change in the women’s work force. Being on the IWL panel will give me a platform to speak up about what I believe is right; equality for all. From Anastasia: The reason why I would like to be on the Student Advisory Panel is because I really enjoy reaching out to my community, spreading awareness on a multitude of topics, and feel as though my leadership skills that I have obtained over the years prove that I am capable of helping others. Previous PostNew Year, New Faces at the IWLNext PostIWL Attends Largest Women’s Conference in the U.S.